Patients and families are at the center of our program. Each individual is treated with respect, dignity and compassion. We believe having the patient at the top of the treatment pyramid, enables Northside Hospital Blood and Marrow Transplant program (NSH-BMT) team to deliver outstanding care and excellent patient satisfaction. The Center for International Blood and Marrow Transplant Research (CIBMTR) and the National Marrow Donor Program (NMDP) has released the 2017 outcomes for blood and marrow transplants using related and unrelated donors. For nine consecutive years, 2009 – 2017, NSH-BMT’s commitment to quality patient care has resulted in the Program achieving survival outcomes that significantly exceed the expected range in related and unrelated allogeneic donor transplants. There were 174 adult and pediatric transplant centers included in the analysis. 1, 2 Please visit bethematch.org/tcdirectory/index/60 to find additional information on understanding blood and marrow transplant survival outcome results. NSH-BMT staff members include nationally recognized physicians, advanced practice providers, nurses, coordinators, clinical BMT PharmD’s, a dedicated health psychologist, nutritionists, social worker, physical therapists and ancillary specialists. The NSH-BMT program is one of the largest clinical transplant programs in the United States, serving patients undergoing blood and marrow transplant , primary leukemia treatment and immunotherapy (CAR T cell). NSH-BMT does not employ interns, residents and physicians in fellowship training – Physician Bio’s. A BMTGA physician is on call 24 hours a day, 7 days a week. We are committed to providing patients and their caregivers a comprehensive pathway to successful outcomes. While NSH-BMT has pioneered successful outpatient transplants, we are able to provide patients with the option to also have an inpatient autologous or allogeneic transplant. At the New Patient Consult and Pre-BMT Evaluation, the NSH-BMT team will meet with each patient and family member(s) to determine if an inpatient or outpatient transplant would be the best treatment/location option. We realize that for some patients, receiving an outpatient transplant is not feasible due to the lack of adequate care giver support, transportation, local housing requirements or financial considerations. The NSH-BMT team works with each patient and their unique personal situation to determine the best location to have their transplant. 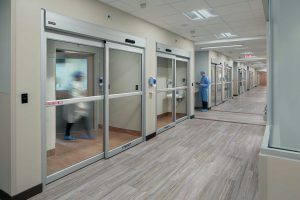 Nationally, NSH-BMT has been a leader in the field of hematopoietic blood and marrow transplant by perfecting autologous and allogeneic transplants in the outpatient setting. BMTGA physician, Dr. Scott Solomon, wrote a peer reviewed article, Outpatient Myeloablative Allo-SCT: A comprehensive approach yields decrease hospital utilization and low TRM. Bone Marrow Transplantation 2010 March;45(3):468-75., which demonstrated that receiving mobilization of stem cells, high dose chemotherapy/total body irradiation and post-transplant follow-up care in the outpatient setting is safe with outstanding outcomes www.marrow.org and excellent patient satisfaction. If you receive your transplant in the inpatient or outpatient setting, you will receive the same outstanding care from our dedicated NSH-BMT Interdisciplinary Team. 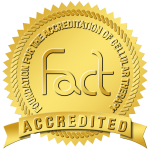 MDS Center of Excellence – The Myelodysplastic Syndromes Foundation, Inc.
NSH-BMT’s clinical program has received perfect FACT inspection scores during their 2003, 2006, 2009, 2012, and 2015 inspections. NSH-BMT Program has received many accolades including national Center of Excellence recognition from the health care insurance industry. 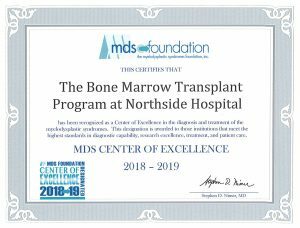 NSH-BMT is among the elite preferred Center of Excellence transplant programs in the United States, as designated by most national health care insurance companies, and serves as a tertiary referral center for patients in Georgia and nationwide. 1 There were 174 adult and pediatric transplant centers included in the analysis. This survival information includes only patients who received their first allogeneic transplant between January 1, 2013 and December 31, 2015 using unrelated or related donors and who had reported follow-up. Specific transplant center information can be found at bethematch.org. 2 For the ninth consecutive year (2009-17) NH-BMT achieved survival outcomes that significantly exceeded the expected range as reported in the Center for International Blood and Marrow Transplant Research Final 2017 Transplant Center Survival Report, December 11, 2017 and from reported outcome data from Be The Match®.